This beautiful 3238 sf 4-bedroom 3.5 bath 3 car garage design features a high entry that opens into a spacious optional study, elegant formal dining, and a spectacular family room, accented by 18 ft towering ceilings that look into an open game room above. A gourmet kitchen with tons of cabinet and granite counter top space and built-in desk area. The kitchen is accented by built-in stainless appliances and beautiful 18- and 20-inch tile floors. A huge butler pantry is between the kitchen and formal dining for serving ease. Around the corner is the large downstairs master suite. The master bath features separate his and her vanities and spacious shower with separate garden tub, and large walk-in closet. The upstairs bedrooms offer a convenient Jack-n-Jill bath option and a media room option available with 7 channel surround sound pre-wire. This award-winning home design is a must see that’s designed for the ‘wow’ factor! 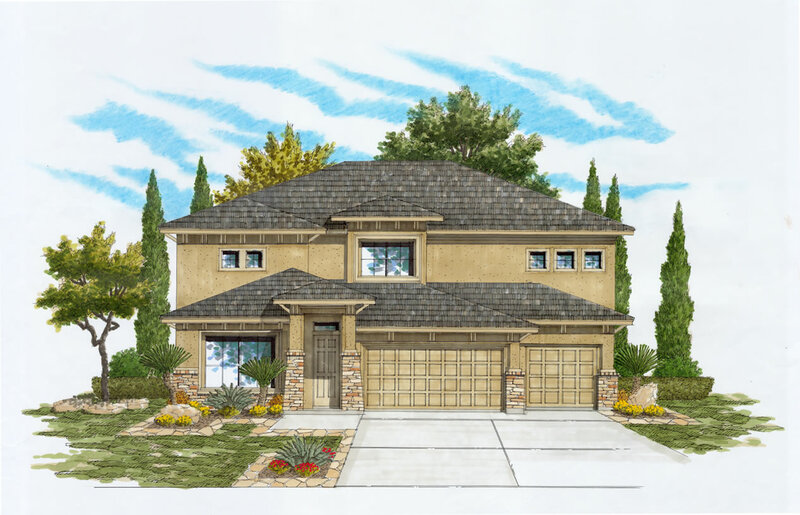 Visit our model of this plan at 14311 Sam Houston Way, San Antonio, TX 78253.